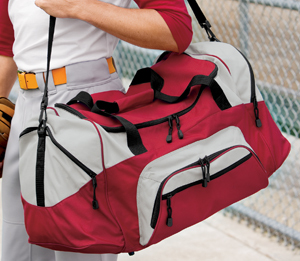 Our best-selling, budget-friendly duffel sized for the gym or weekend getaways. | 600 denier polyester D-shaped zippered entry for easy access Padded handle Detachable,adjustable shoulder strap Two front zippered pockets Two large side pockets Dimensions: 13.5'h x 27.25'w x 14.5'd; Approx. 5,372 cubic inches Bags not intended for use by children 12 and under.